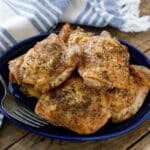 Juicy chicken thighs with a crisp and flavorful skin are possible with less than 5 minutes worth of effort! This crispy chicken is made in the oven without any breading at all; the only ingredients you need are the chicken, a drizzle of oil, and a sprinkling of spices. I’ve been making different variations of our crispy pan-fried and crispy oven-fried chicken for the past few years and it just doesn’t get old. 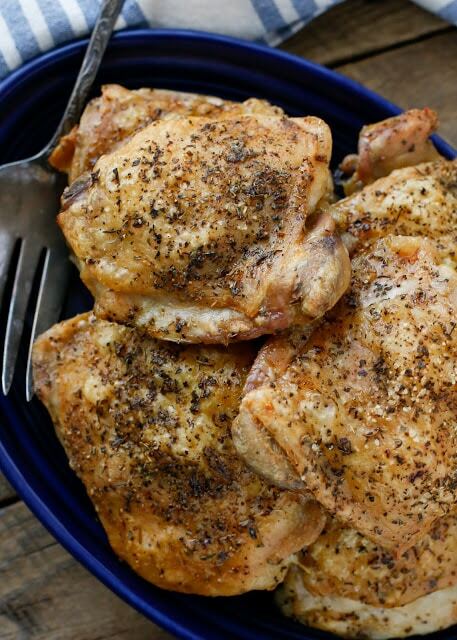 The recipe is dead easy and my whole family loves this chicken. It will likely be the easiest chicken dinner you’ll ever make. No marinade, no fancy ingredients, just a sprinkling of spices that are likely in your pantry already. I like to serve this chicken with the Italian Rice Pilaf from my cookbook and a salad, but it would also work well with coleslaw, pasta salad, or potato salad. Kitchen Tip: I use this sheet pan when making this recipe. Preheat the oven to 400 degrees. Line a large baking tray or half sheet pan with foil and place all the chicken pieces on it, skin side down. Sprinkle with salt, pepper, and spices and flip each piece skin side up. 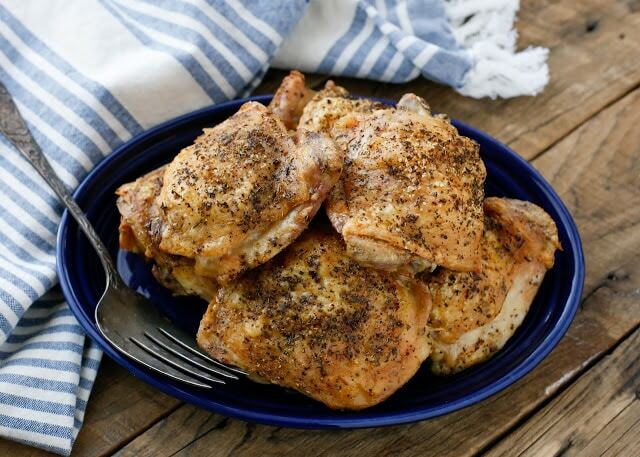 Drizzle a little oil over the skin on each piece of chicken and rub lightly to coat. Sprinkle again with salt, pepper, and spices. Excited to try this tonight! Love things that are yummy and easy to prepare! For what it's worth, I make it exactly this way every single time. Feel free to adjust it however you like. The chicken will cook through, however, the skim may not be nearly as crispy. So easy and so yummy! This is a major keeper recipe! WOW!!! An HOUR at 400?? Sounds like it would all end up scorched. It sounds like a great recipe and I read the comments to see if anyone addressed this concern. I thought maybe some of the instructions were missing. I may just have to try it and see. It just plain works, Dave. If your oven happens to run hotter, you may want to adjust the time slightly. However, an hour is perfect for most ovens. This was a fantastic recipe! My family gobbled their chicken up in no time. It was the crispiest, juiciest, most tender chicken we ever had. Thank you so much!!!! I'm so happy you enjoyed the chicken, Laurie! I'm so glad that you like the chicken, Jolene!